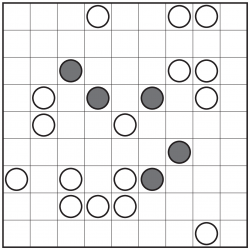 The aim of Masyu is simply to draw a single loop that passes through the centre of every circle in the puzzle, as in the example in the bar on the right. At shaded circles in the grid the loop must turn through a right angle and then continue straight for at least one square each side. 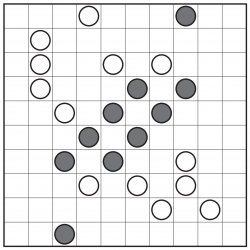 In contrast, at white circles the loop must pass straight through without turning but then must turn through a right angle on either one or both of the adjacent squares. The loop cannot enter any square more than once, and it may only consist of horizontal and vertical lines. 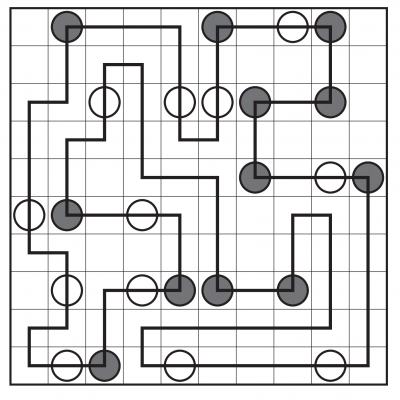 It's not necessary for the loop to travel through every square, but it can't visit any square more than once - and there can be only one loop (and no line fragments left over either!). 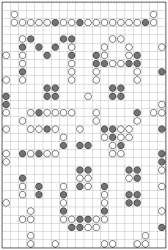 Masyu is a satisfying puzzle to solve because there's usually at least one part of the process where you're surprised about the way the loop goes - it's surprising how many twists and turns can fit into even a small puzzle grid! 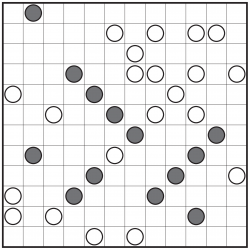 There is only ever one possible solution to a Masyu puzzle, which can always be reached via reasonable logical deduction. 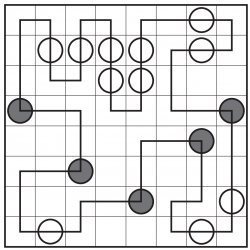 We can supply Masyu puzzles at a range of sizes and difficulties, and all of our Masyu puzzles are currently entirely hand-made.